You are here: Home / giveaway / closed giveaway / Holiday Gift Guide Giveaway! Did you see our 2010 Holiday Gift Guide? It is a collection of some of our favorite products that we’ve purchased or tested over the past year or so. They’ve made such a positive impression on us that we’re confident in recommending them to you. In honor of our gift guide, we are also hosting a special Holiday Gift Guide Giveaway!! One winner will receive a $50 Amazon.com e-Gift Certificate! 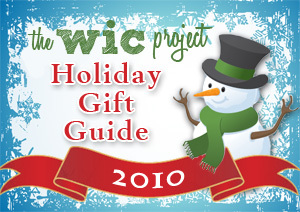 MANDATORY ENTRY: Visit the WiC Project Holiday Gift Guide and leave a comment here with your favorite item and who you want to give it to. For ONE bonus entry per day, tweet out the following message and comment here with the link to your tweet. For ONE bonus entry, “Like” The WiC Project on Facebook and leave a comment with your FB name. Feel free to drop a note telling us you stopped by. For ONE bonus entry, follow the WiC Project via Google Friend Connect (in the right column) and leave a comment with your name. For ONE bonus entry, subscribe to The WiC Project via reader and leave a comment letting me know that you have. For ONE bonus entry, subscribe to The WiC Project via email and leave a comment letting me know that you have. Make sure you confirm your email address. Giveaway ends at 11:59 PM EST, December 14, 2010. My ds16 would love that last Airbender Dvd series! The Harry Potter DVD would be great for the kids! My favorite item is the Sound Of Music DVD set and I’d love to give it to my daughters. I’d love to get a Bake Me a Wish Cake for my grandmother. I follow you on Twitter [@skaketgirl] but I believe the link in #2 leads to someone else’s Twitter account. I like your blog on Facebook [Katie Edwards]. Had the same issue as with Twitter…link lead to same person as Twitter account, which is not WiC Project page. My favorite item is the Bake Me A Wish Ccake and I’d love to give a Tiramisu cake to my brother! i would get the sound of music for my mom! I would love to give my husband the Logitech Harmony One Universal Remote! I’d get Harry Potter DVD for my son. I’d love to get the Avatar: The Last Airbender for my nieces. We used to watch it together once in a while when it was on Nick and they really enjoyed it. Great show. Harry Potter DVD is my favorite item that I would give to my grandson! I would get The Sound of Music: 45th Anniversary Edition Blu-ray/DVD for my nephew, because he is a huge fan of that film, so it would to be nice to see his face light up on Christmas Day. I’ll give The Sound of Music to my friend Sherrie. I would like the Deep Kneading Shiatsu foot Massager for my husband. My favorite is The Sound of Music DVD for my daughter. My favorite item is the Logitech Harmony One Universal Remote, and I would give it to my son…. or I might give it to myself. HA!! I would get the sound of music for my mom. from the WiC Project Holiday gift guide to my daughter. Bake me a Wish Cake, for a co-worker. I liked you on facebook. THANKS!!! for the AWESOME!!! GIVEAWAY!!! My favorite item would be StarCraft II to give to my brother. He’d love it! I joined via GFC too! My favorite item is The Sound Of Music DVD, my daughter would love it. She was just saying the other day that she would love to have it. I like the Logitech Harmony One Universal Remote. I would give the Sound of Music DVD to my sister. I would love to gift the PedicureSpa Salon Footbath to my mom! I would like to give my mom the Deep Kneading Shiatsu Foot Massager. She would love it. I would give the harry potter dvd to my son. I want the Logitech Harmony One Universal Remote . I like the The Sound of Music DVD for my mother-in-law. The Sound of Music DVD wonderful dvd. I like the Deep Kneading Shiatsu Foot Massager for my husband. I know both of my kids would love the Avatar: The Last Airbender DVD box set! I’d choose the Deep Kneading Shiatsu Foot Massage and give it to my husband. He has trouble with his feet hurting. The footbath. Mom is on her feet all day and I know it would be appreciated. My daughter would LOVE to get a Fashion Playtes custom clothing gift card. She loves to design clothes, this would make her day to design something for herself. I would buy the Harry Potter dvd for my husband. I would like the “Sound of Music” for our collection. I’d give the Foot Massager to my mom! I would like the Make a Wish Cake for my niece and family. We are always invited to their house for the holiday..
My favorite item is the Bake Me A Wish Cakes! I want to give one to my boyfriend and hopefully he’d share some with me! The Harry Potter DVD is my favorite thing. I would give it to my son. i really like the Deep Kneading Shiatsu Foot Massager. it would be great for my mom. I love the HUGO by Hugo Boss for Men and I would give it to my hubby. Deep Kneading Shiatsu Foot Massager for my husband. The Deep Kneading Shiatsu Foot Massager would be the perfect gift for my sister’s poor feet! Avatar: The Last Airbender Cartoon Series seems to have as many fans who are adults as kids. I plan to get it for my brother in law. I would love to give the “Bake Me a Wish Cake” to my Mother in law. She could really use some holiday cheer right now. Logitech Harmony One Universal Remote and I’d give it to Hubby to simplify his life. We always loose track of atleast one remote. I would give the Deep Kneading Shiatsu Foot Massager to my aunt. She always says her feet hurt. I’d like to give the Footbath to my friend who stands all day at work. I like the Sound of Music DVD. I like the Deep Kneading Shiatsu Foot Massager and I’d like to give it to my mother! She would love it! I love the bake me a wish cake! I would love to have that at my mother’s house for the holiday. I’d like to give the Logitech Harmony One Universal Remote to my husband so he’s not always digging around for this one or that one. I’d get the Bake Me A Wish Cake for my friend Chris. Thank you for the giveaway! I’d get the HUGO by Hugo Boss for Men for my three sons. The Starcraft II: Wings of Liberty looks great. Following Wic Project on twitter. I like the Bake Me A Wish Cake because I could share the prize with all of my family. The Logitech Harmony One Universal Remote would be a great gift for my dad. I like the PedicureSpa Salon Footbath. I’d love to win the Deep Kneading Shiatsu Foot Massager for my mother. She works on her feet alot. Inspirational Coffee Mug would be great for my mother! Probably get the Logitech Harmony One Universal Remote and give it to my parents. They have way more electronics that we do. I like the Inspirational Coffee Mug and I’d give it to my mom. The Jesus Movie or the Sound of Music – love them. I would get the Logitech Harmony One Universal Remote for my husband! I would love to get the Bake Me A Wish Cake for my mom! I would buy The Sound of Music blu-ray for my best friend, it’s her favorite Julie Andrew’s film! Favorite item – The Sound of Music DVD. I’d give this to my sis – she’d love it. My son would absolutely adore the last Airbender Dvd series! Deep Kneading Shiatsu Foot Massager would be great for my father. Thanks. I would get Harry Potter and the half blood prince for my son. I’d love to give The Sound of Music to myself. I’ve never seen it. Shameful, I know! i would love Deep Kneading Shiatsu Foot Massager for my sister so she could get a good foot massage every day! I left a comment at California Blooms Roses Review post. logitech harmony one is my fav. id give it to my brother. I would give my kids the video Avatar: The Last Airbender. The kids would love it. I would select the SpongeBob SquarePants Bikini Bottom 500 and give it to my daughter would really enjoys watching SponeBob SquarePants. I would love to give my husband the Logitech Harmony One Universal Remote, he loves gadgets! I’d love to get the Hugo by Hugo Boss for Men cologne for my hubby. The memo board would be really cool for my mom! left a comment on the gift guide! The Bake Me A Wish cake for my daughter. I’d give my aching feet the gift of a Deep Kneading Shiatsu Foot Massager. My favorite item is the Bake Me A Wish Cakes. YUMM! I commented on Musselman’s Hot Mulled Apple Cider. I would like the Harry Potter DVD for my Potter fan grandson. I would want to get The Sound of Music for my mom! She loves that movie (and so do I)! the deep kneading foot massager for my husband since he works so hard for us. I want to get The Sound of Music for my sister. cindyhinckley at msn. I like the sound of music DVD for my Aunt. I’d give it to myself as a gift. My favorite item is the Logitech Harmony One Universal Remote and I’d give it to my husband. He watches tv 24/7 and is in need of a Bigger Remote that he won’t LOOSE!!!! for my husband. That way I won’t have to rub his stinky feet anymore!!! The Bake Me a Wish cakes are my favorite item. I would love one for my grandma! Thanks! I would love the Sound of Music for my whole family to watch. I follow WiCProject as wiscmom24 on Twitter. My favorite product is the Harry Potterand the Half-Blood Prince DVD, and I would give it to my husband. I like the Bake Me A Wish Cakes. I’ve received them for my birthday and can attest to the fact that they are delicious. I could give these to my brother and my mother. They have a greater variety of flavors. The lad airbender dvd series would be a great gift for my niece. My girls and I loved watching it together through netflix. I would get a Bake Me a Wish Cake to share in my office, you can never go wrong with tasty treats.